Gameenschap. Cообщество. Comunidade​. مجتمع. Community is now, and ha​s always been, at the core of human existence. Regardless of geography, language, politics, people have found reason and purpose through community. But something new has begun to happen, a change in the appearance of community. Once confined by location, community has broadened it’s expanse in the digital age. 2 Billion Under 20 however, takes the whole damn thing to another level. Composed of the stories of 75 millennials, the 2 Billion Under 20 (2BU20) book is an incredible look at what is possible. Bright and ambitious, these young people show the world that age does not necessitate experience or ambition. Youth and vitality are defined strengths, while the common stereotypes of lethargy and impetuousness are clearly absent from the lot of them. 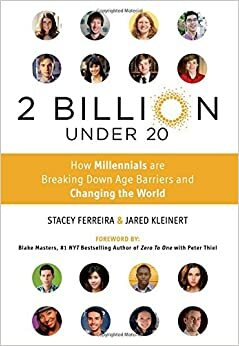 Based on the existing 2BU20 digital community, the book emphasizes founders’ Stacey Ferreira and Jared Kleinert true mission, to empower the worlds youngest 2 billion people to follow their passions. As the team collected stories, concordantly growing their brand and expanding their own networks as they hoped to teach others to do, they were learning as much as they were hoping to teach. Through their efforts, they created and collected what is undoubtedly the clearest testimonial to the power of the next generation. 2BU20 shows us what the best of this world will give us in the years to come. 2BU20 pushes us to greatness. Usspire has always fought the notion that the Millennial generation is lazy, entitled, that it expects to be given greatness without striving for it first. What 2 Billion Under 2o does is give a face to this opposition, proving through 75 examples the ambition and diligence of this coming generation. It is easy to attack a group with no voice, but through 2BU20, Generation Y is able to shout it’s dissent from the norm, disrupting the former status quo and the stronghold of the old. You can learn more about the movement, suggest a book tour location and sign up for the 2 Billion Under 20 community here.